We've just spent the bulk of the morning sorting through boxes of material that have been in our storage unit for the past few years. In some cases the boxes haven't been opened in over ten years or more so you can imagine the amount of pure rubbish that we're throwing out and also the delight in finding items thought to be long lost and/or stolen by ex spouses and/or casual fling partners (moreso in my case). Despite all the crap that A First Salvo became two great things, personally, came out of it and these are it. It was my idea initially to have Alan Weiss ink Norm Breyfogle and vice versa, and I always wanted to buy the end results, so you can imagine my joy when this finally arrived in the mail. However I've always felt a bit bad for introducing Alan to the Salvos, considering what happened, but as has been pointed out to me by another close pal, if you're going to go supernova who better to flying the ship than Alan Weiss? Good point. 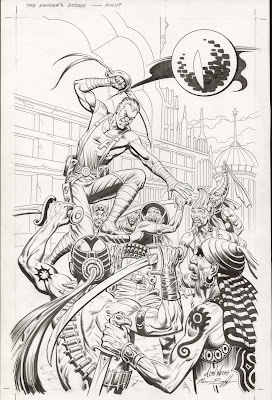 This was pencilled by Alan and inked by Norm. Apparently it was used as a pin-up and I'm pretty sure I do have the image in one of my four issues of Dangers Dozen somewhere, but I'm not going to bother to pull them out. Alan's pencils were very tight and Norm did his usual sterling job of inking. 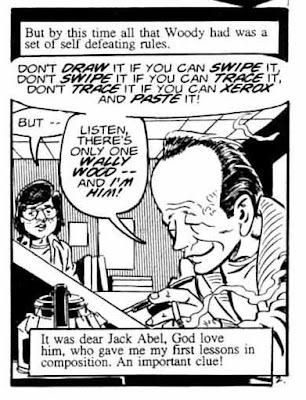 I've yet to see an image yet that Norm hasn't enhanced and improved with his brush. "He's one mysterious Dominican." With those words of wisdom Dave Simons introduced me to the world of Armando Gil. Hailing from Santa Domingo, Armando Gil is a name known to virtually every collector of original comic book and any fans of comic books in general. He forged a career at Marvel with one of the most distinctive inking styles seen - at times his art looked like molten steel, fluid yet firm and strong enough to hold up against anyones. I TIVO the GSN reruns of the "What's My Line?" kinescopes every night and Debbi and I often watch them during dinner. Yesterday they broadcast the WML? episode of June 22, 1958. After mystery guest Andy Griffith failed to stump the panel, the fourth and final contestant, a Mr. Alois S. Knapp, entered and signed in. Mr. Knapp was a slight, elderly gentleman, sporting a white spade beard. My Spider-Senses began to tingle! That's when the light bulb flashed on over my head, and I knew where I knew this guy from. People might remember back in late October I spoke about the now defunct publisherFirst Salvo and how they treated Alan Weiss and myself, namely by commissioning a story and not paying us, and also refusing to pay Alan for outstanding work that he'd done for the company. Just for the record, to date they've still yet to pay either of us (as I've told them - they can refuse to pay me, that doesn't bother me, much, but they are honour bound to pay Alan) and have not responded to numerous emails. Since that initial post I've had more contact with artists who've shared various stories with me about the conduct of the Salvos, how they promised a lot of work and then ceased contact without explanation.